...not forgotten. 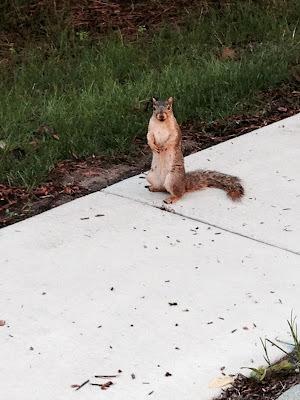 Yes, the blog's installment of "Saturday's Squirrel" might be on a bit of a hiatus, but know that our furry friends are not forgotten. How could they? So, as the leaves change colors, our furry friends will be preparing for the upcoming winter, and their antics will be in high gear. With that being the case, how could we NOT bring back everyone's favorite blog piece? On hearing of Saturday's Squirrel return to the Gentlemen's Monthly lineup, this squirrel paused, stood up, and non-verbaled, "Thank you." No, thank you...furry friend...thank you.